Psoriasis is an inflammatory condition of the skin that leads to well-defined red areas, often covered by a silvery scale. The most common areas affected by psoriasis include the elbows, knees, scalp, nails, and lower back. Occasionally itching may be present. 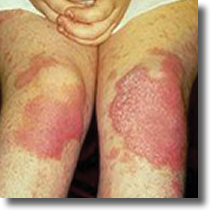 Psoriasis is common, chronic and recurrent. It affects almost 1-2% of the population. Psoriasis is caused by abnormal overgrowth of skin cells in a process driven by inflammation. Hereditary factors also contribute in approximately 30% of cases. Occasionally psoriasis may be associated with arthritis. vitamin D creams, or vitamin A creams. 2. Oral medications include methotrexate and vitamin A tablets. 5. Biologic injectable agents for patients with large areas affected by psoriasis. In ethnic skin, psoriasis may be associated with severe discoloration and scarring. Thus, the goal is to limit the formation of psoriasis before it spreads. New research also shows that people with psoriasis are at higher risk for diabetes and heart disease. Given that ethnic patients have a higher risk of diabetes to begin with, it is important to discuss this fact with your dermatologist.